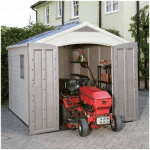 This uniquely attractive 10×8 reverse apex plastic shed makes a stunning addition to the garden. Its chic design is just one of its many excellent features. Benefitting from dual entrances, 100% shatterproof windows, 10 year anti-rot guarantee and high density polyethylene panels, this truly does give you exceptional value for money. 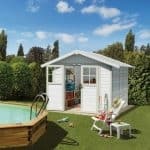 This is a very unique plastic storage shed created by top manufacturer Lifetime and it comes with a huge amount of great features. Ideal for storing tools and equipment, or even as a bike shed, this reverse apex building looks just like a miniature house. The roof comes with excellent rain water protection. 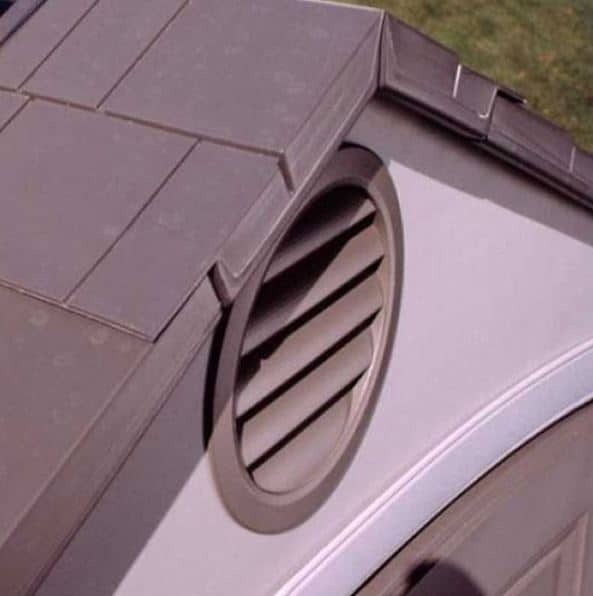 Unlike standard apex roofs, this one has both a horizontal and apex roof feature. 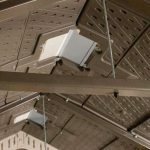 This means you get an even taller interior space than you do with traditional apex roofs. 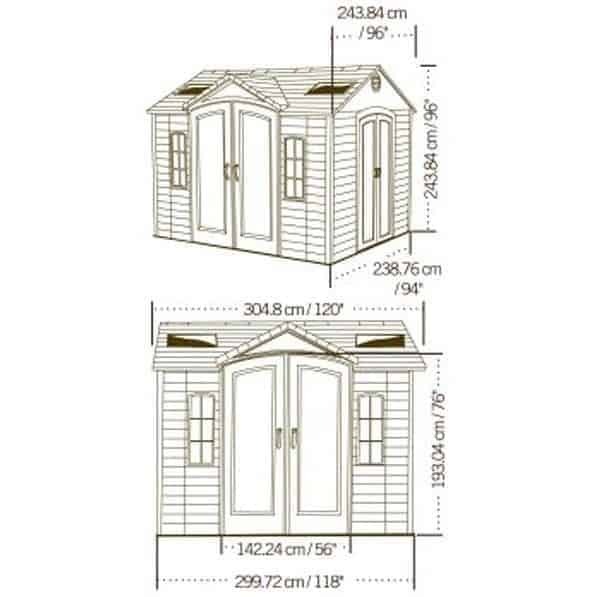 The eaves of the shed reach up to 1.80m, while the roof height measures a fantastic 2.44m. It has quite a compact width, measuring 2.95m, while the depth measures in at 2.34m. The doors give you a good deal of space to comfortably walk in and out of the building, measuring 1.24m wide and 1.93m high. 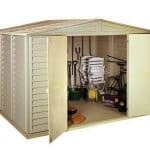 Don’t let the fact that the shed has been built with plastic fool you into thinking it will be fairly weak compared to metal and wooden sheds. 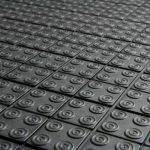 Lifetime have made sure that it has been built with incredible stability and durability benefits. 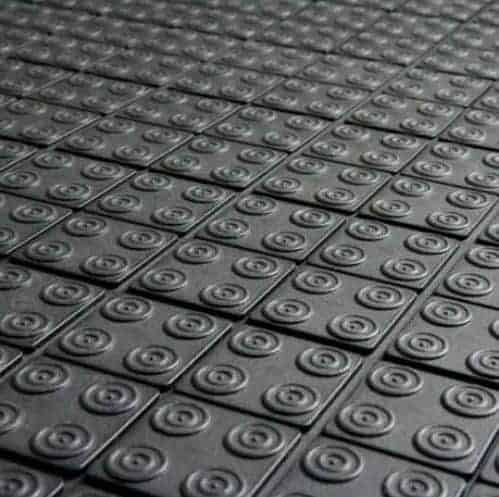 The high density polyethylene panels are enhanced with a powder coated steel frame. They have also been UV protected which means they will not fade, warp or crack over time. As the shed comes with a floor, it means you have great flexibility regarding where you can install the building. As long as you assemble it on a firm and level surface it will stand strong for many years. Due to its unique design, this shed doesn’t require any annual treatments. This is fantastic news for your wallet. It also means the only effort you have to put into this building is the actual assembly. Once that’s over with, you can just enjoy this attractive storage space and the many benefits it offers. As an added benefit, Lifetime also provide a 10 year anti-rot warranty. So not only can you rest assured that it is protected against rainwater and UV rays, but it is also not going to cause any issues with rot for a decade. We absolutely love the dual entrance design of this shed. 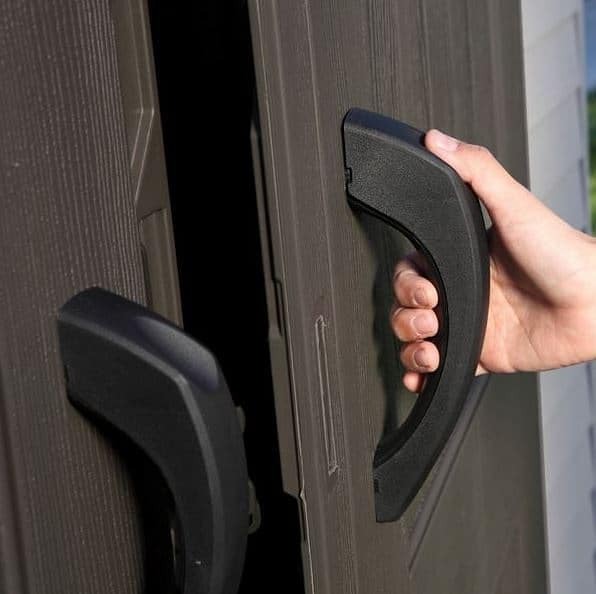 Offering not one, but two sets of double doors, gaining access to your storage couldn’t be easier. What’s even more impressive is that all of the doors feature a high strength design and are double hinged for complete reassurance. Rarely do you find a shed that offers such high quality doors so this is definitely a stand out feature. There are windows on this building and they boast a stylish, chic design. They aren’t very big so privacy isn’t a massive concern and they feature a six block style. Made from 4mm twin wall polycarbonate glazing, they are an excellent alternative to glass and benefit from being 100% shatterproof. This makes them a lot safer for family homes. As the windows are quite small, translucent roof panels have been provided to increase the amount of natural light in the building. They are quite big so the amount of light you get is pretty good and eliminates the need for an electrical pack. As there are windows, the things you store aren’t completely private. However, as mentioned earlier, they are small windows and their six-block design does provide a slight vision barrier. We still recommend you invest in an alarm system or a high quality lock if you plan on storing anything valuable however. The security of the shed could also be improved. It does benefit from a solid, tough exterior which would be difficult to break into. There’s also the shatterproof windows which are pretty strong too. However, it would best suit a secure garden away from public view. There aren’t actually any customisation options available with this shed. However it simply doesn’t need any changes made to it. 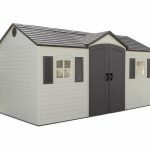 Everything from the appearance of the shed to its durability and functionality is exceptional. There also aren’t any extras available for the same reason. The good thing about this is that obviously you don’t have to spend more money on upgrading the building. Lifetime have outdone themselves with this shed. The quality is amazing and ensures you benefit from a really long lasting building. 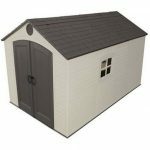 Compared to other plastic sheds, the longevity of this one is really good. You’d expect plastic to be fairly weak and not as durable as wood or metal. However, thanks to its high quality construction, this shed will last a minimum of 10 years. 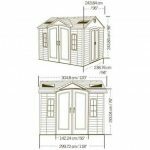 The storage potential of the shed is great and the fact you can access the building via front or side double doors is also a major benefit. We were dubious about just how easy this shed would be to put together. It looks like a very complex building. However, we were pleasantly surprised that it is actually really straight forward thanks to the detailed, clear instructions provided. The only thing we do advise you on is that it will take a while to put together. By that, we estimate at least a day with 2 people working on the assembly. We aren’t surprised by the high cost of this building. After all, it has a very unique and attractive design, as well as a lot of excellent benefits. 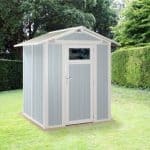 It is the great features we have taken into account when working out the sheds value for money. It doesn’t need special treatments and requires no maintenance or extra upgrades. 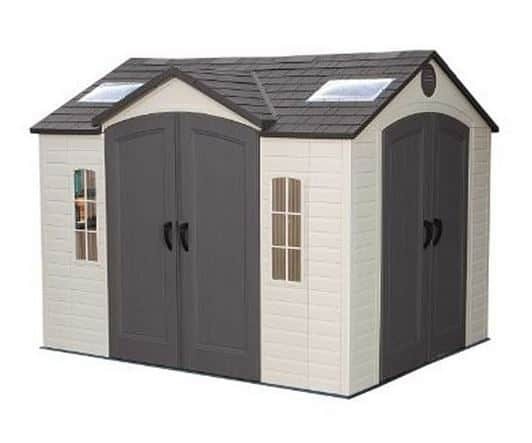 Final Thoughts: If you’re looking for a shed with character, this is definitely one to consider. Not only does it come with a very unique design, but it also benefits from a lot of fantastic features. Providing awesome value for money, this building will make an excellent addition to any home.